Your challenge, if you choose to except it, is to tie down your motorcycle in the back of the trailer or truck bed as best as you can. We'll be throwing all sorts of things at you while on the road, things that will cause you to slam on the brakes or swerve out of the way quickly. These kinds of obstacles are designed specifically to cause your bike to shift and eventually to fall over, or better yet, fall out and onto the street destroying it. Perhaps your scrawny, inexpensive tie downs from Harbor Freight will do the trick, but in today's society with all the texting and lack of general awareness on the road, I doubt it. Transporting your motorcycle shouldn't be a stressful endeavour. The thing is, though, you gotta invest in some decent tie downs to have a little piece of mind. 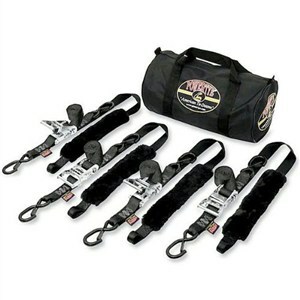 That's exactly what the Powertye Fat Strap Motorcycle Tie Down Kit does, is give you piece of mind your bike will make it without falling. They're 11/2 inches wide, use a heavy-duty and ergonomic rubber handle, and come complete with vinyl-coated latch hook secure ends. The sleeves are genuine sheep skin, and everything fits in a convenient zippered storage bag. You spent good money on the bike; you might as well spend a little money keeping it secure when you've got it in tow.